Rotimi Amachi,Minister of Transportation, says his quest for a change in governance in Nigeria prompted him to make up with the All Progressives Congress to remove Goodluck Jonathan and the Peoples Democratic Party from office. 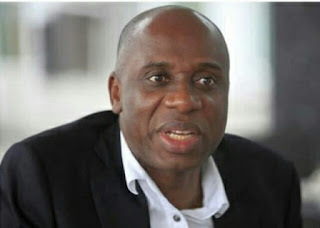 Speaking at the Future awards that held over the weekend in Lagos, Amaechi said his defection from PDP to APC was borne out of his desire to see a better Nigeria. ‘“I moved from PDP to APC because I was tired of what was happening in the party, I have the option to stay because of my position as the Chairman of the Governors then. I can use my position to fight them (PDP) and get what I want because I believe Nigeria was not going in the right direction by then. My attention and belief shifted to Buhari which was the viable alternative. I believe in the change mantra because it is the only way to improve on what is on ground. He has not disappointed because the economy is now back on track and is growing. This is evident in the current prices of food items because it’s getting lower’ he said. With the change going on, the price will further crash because before this government came in, the price were soaring because we were importing food items, things we can grow here. Now the policy of government is working which banned the importation of rice, the price is now about N16,000, but before now, we are importing about N3 billion worth of rice. Before now too, we were importing another N3 billion worth of poultry products, we are importing tomatoes but with the ban, we are now concentrating on our local production. Many states in the northern part of the country are now growing rice in large quantities though by right, the South-South geo-political zone should be doing that because they are the ones in the swampy area’’.